The sponsorship of three Northampton Bristol Street Motors car dealerships has aided the development of five future stars for League 2 side Northampton Town Football Club. The three dealerships, Bristol Street Motors Peugeot, Vauxhall and Nissan, are currently sponsoring the Northampton Town FC Academy teams in a three-year deal as part of their commitment to supporting the local community. Each team, from the under 9s to the under 18s who play in the Football League Youth Alliance, has benefitted from the significant sponsorship, which provides kit and equipment for the players, with the Bristol Street Motors logo displayed on the back of the playing shirts. Since the sponsorship started, five Academy players, Dean Snedker, Lewis Hornby, David Moyo, Connor Roberts and Ivan Toney have progressed into the first team, in particular Toney whose three goals in two games at the end of last season helped Northampton Town retain their Football League status. Bristol Street Motors Peugeot, which is based on Fortune Close, and Bristol Street Motors Vauxhall and Nissan, based on Carousel Way, offer a full range of new and used vehicles, as well as servicing, MOTs and winter checks on all cars. 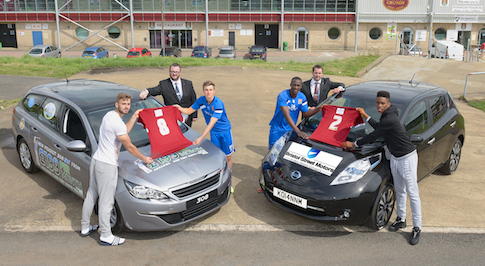 Mark Dale, General Manager of Bristol Street Motors Nissan Northampton, said: "The dealerships are very proud to be working alongside the Northampton Town FC Academy to help the footballing stars of the future. Ivan is a testament that, with support and encouragement, you can achieve success and we are grateful we could help develop his talents. Sport is important to the people of Northampton and the football club is at the heart of the community and Bristol Street Motors is proud to be associated with them." Northampton Town's Academy Manager Trevor Gould added, "We are very fortunate to be able to call on the support of a number of fantastic sponsors, including Bristol Street Motors and the support they offer us is very important. "It is ever more so important for a club like ours to produce players from the local community and to do that we need the support of the local businesses to help us turn this talent in to professional footballers. All of us at the Academy are truly grateful for the support Bristol Street Motors provide in helping us to turn the dreams of some Northampton youngsters into reality."